The inaugural visit of US President Donald Trump to the Asia Pacific region will kick start with a visit to a close ally, Japan on November 5-7. On the agenda is his meeting with Japanese Prime Minister Shinzo Abe. Besides a round of golf on the first day of the visit, they are both expected to discuss issues pertaining to stability in the Korean Peninsula, trade relations and the looming presence of China in the region. Trump is likely to keep a keen eye on the region but adopt a “hands off” approach overall. Key to the success of such a strategy is an emboldened Japan – one which isn’t too militarily reliant on the US. Reeling from a landslide victory in recent elections and a renewed mandate to serve as Prime Minister, Abe will be emboldened forward his ambitions for a remilitarised Japan to Trump who is likely to welcome that notion with open arms. Trump has previously expressed his opinion that Japan should “protect itself against this maniac of North Korea” – in reference to North Korean dictator Kim Jong-un – and recently he tweeted that Japan and South Korea would be allowed to purchase “a substantially increased amount of highly sophisticated military equipment” from the US. How would a remilitarised Japan effect ASEAN, is still subject to debate. 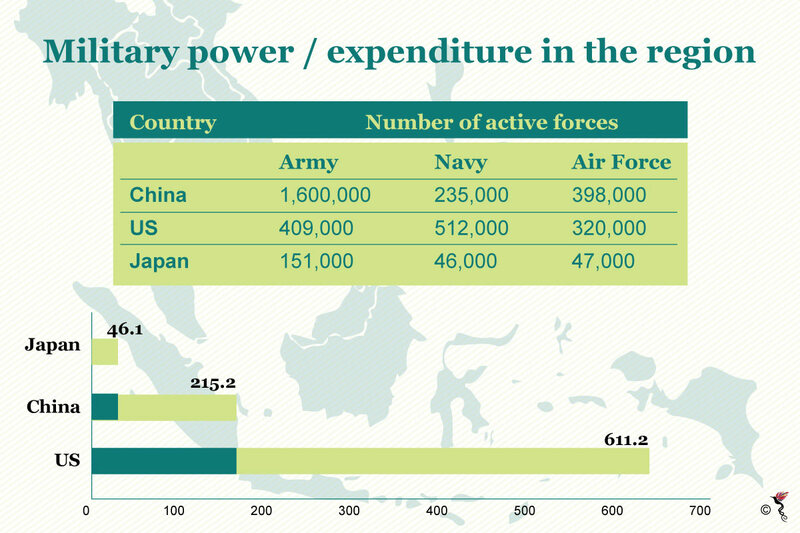 The military balance in East Asia. Expenditure indicated in billion dollars. One on hand, it could place the region in a position of instability and unpredictability. According to Senior Fellow at the Institute of Strategic and International Studies (ISIS) Malaysia, Bunn Nagara, a rearmed Japan might make ASEAN member states warier of the country, especially those that had suffered under Japanese occupation in World War 2. “A remilitarised Japan may destabilise its relations with South Korea and China in Northeast Asia, putting ASEAN and its member states on guard,” he remarked in an email reply to The ASEAN Post. Nevertheless, he stated that ASEAN-Japan relations are not likely to be much affected unless Japan returns to belligerency. Moreover, Japan must be cautious of being overconfident when dealing with North Korea militarily. “Over-confidence may lead to overzealousness,” he added. On the other hand, a militaristically strengthened Japan may serve as the perfect balance to China’s creeping assertiveness in the region. Nevertheless, Vargö argued that even if Abe is successful in amending the constitution – granting Japan a standing army – militarism is unlikely to dominate domestic political affairs like it did in the 1930s. In short, Japan would not try to dominate any ASEAN member state with its military. Renewed hope for the TPP? In the aftermath of the US exodus from the Trans-Pacific Partnership (TPP), Japan has been the informal leader of the trade deal negotiations. Trump’s rescindment of the agreement has yet to stop the remaining 11 countries from pushing forward with the TPP. Nevertheless, in many instances, Abe has made it clear that he strongly wishes for the US to return to the TPP and has urged during negotiations for a backdoor to be left open in case the US wishes to re-join. A renewed Abe is very likely to bring the TPP issue up with Trump in an effort to coax the latter to reconsider his previous stance on the trade agreement. It has been a long-held belief by analysts and observers alike that Trump’s main reason for pulling out of the deal has everything to do with him undoing the policies of his predecessor. “If the agreement can be re-sprayed as a “Trump deal” then there is a slim chance,” Chris Nixon, Senior Economist at the New Zealand Institute of Economic Research (NZIER) told The ASEAN Post in an email reply. As it stands, the answer is no – Trump would be unlikely to re-join the TPP any time soon. 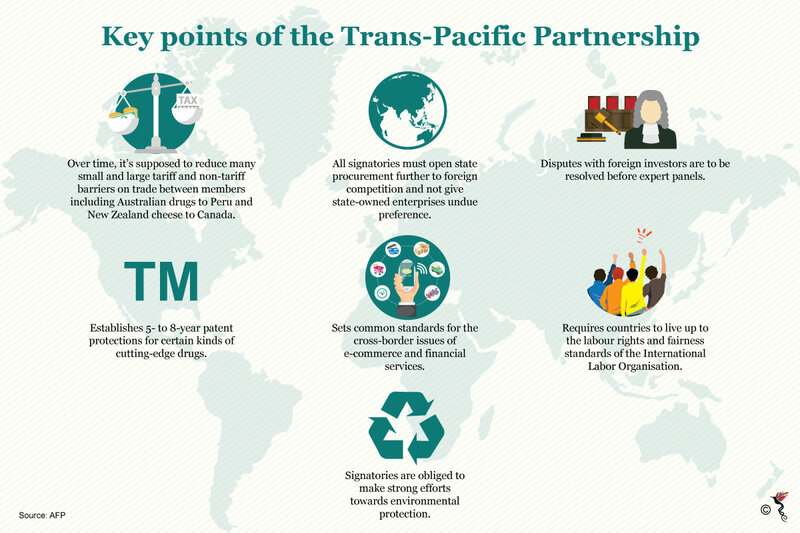 Key points of the TPP. However, Trump is not going to be in the White House till kingdom come and in the off chance that he is re-elected, he will be Commander in Chief for a grand total of eight years. Any administration which comes after his might be susceptible to re-joining the deal which justifies Japan’s aspiration to have a backdoor open for the US. “What happens after the Trump Administration is difficult to forecast. However, if a TPP-11 is formed, and a new administration is in place, with some trade being diverted away from the US and with a more rapidly growing Asia, there will be pressure within the US for the United States to join,” Mary Lovely, a Visiting Fellow at the Washington DC based, Peterson Institute for International Economics told The ASEAN Post in an email interview. Japan and the rest of the countries involved in the TPP have set an ambitious deadline – by November of this year – to ink a deal. Even with China looming in the shadows, with its own philosophies and approaches to regional trade, experts believe that a renewed TPP would be a welcome proposition by Beijing. Whether a militarily heightened Japan or a Japan pushing vigorously for increased US economic presence in the region, the implications of a change in the dynamics of US-Japan ties will reach the shores of Southeast Asia very quickly. As such, Trump’s meeting with Abe should carefully monitored by ASEAN leaders and citizens alike.